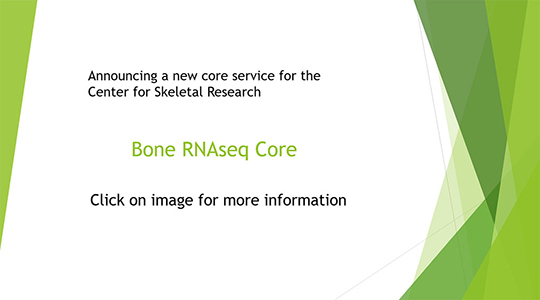 Dr. Matt Warman at Children’s Hospital, Boston, has agreed to organize and host a Bone RNAseq Core as a key offering of the Center for Skeletal Research. The core will offer three tiers of service. Each service…. Design of bulk tissue and single cell RNA sequencing experiments. Dr. Warman and his lab members at Boston Children’s Hospital will be responsible for helping other investigators design their RNA sequencing experiments. A typical consultation will take 1 or 2 hours and will be billed at rates determined partly to account for indirect cost calculations ($62/hour). The advantage of seeking advice from the Warman Lab is that they know about all the current bulk and single cell RNA sequencing technologies and have experience determining the number of samples (both biologic and technical replicates) and depth of sequencing that are required to obtain statistically meaningful results. Help with tissue and cell preparation. Access to space, equipment, and expertise for performing bulk RNA extractions from bone and cartilage tissue, or recovering single cells from these tissues for single cell RNA library preparation. The RNA sequencing core has tissue pulverizers, tissue culture hoods, and incubators that can be used for short-term experiments to recover RNA and intact cells. Dr. Smits, Ms. Jennifer Hu, and Ms. Mara Coyan will be available to teach RNA and cell extraction techniques, and RNA sequencing library preparation to first time users at a rate of $62/hour, along with a $25/hour equipment use fee. Access to the equipment alone is possible and will be billed at $25/hour. Investigators will need to bring their own disposable supplies. The core will provide investigators ahead of any experiment with the list of supplies that will be needed. Computational and statistical interpretation of RNA sequencing data. Dr. August Y. Huang, a post-doctoral trainee in Dr. Warman’s laboratory can provide data analysis and interpretation at a rate of $62/hour. Dr. Huang and the investigative team will discuss aspects of the analysis that might be specific to the experiment in question. Otherwise, standard RNA sequencing data analysis algorithms will be performed and Dr. Huang will review the data and their meaning with the investigative team. The investigative team will need to be responsible for maintaining storage space for the RNA sequencing data, or the RNA sequencing core will provide storage space for a fee.